Haatstrijd was born in 2001 as a solo-band of vocalist Nachtvorst. Two demo's were recorded and released on tape in the second year of it's diabolical existence: "Demo 2002" and "Nachtgruwel". Both also appeared on a compilation tape bearing the name "Zwart Bloed" during that very same year. In march 2003 the "Suicide Campaign part 1." split tape (with the Belgian "Verloren" and Brittish "Odium") was released by the Belgian label "Soldiers of Sudarium", of wich Theriomorph soon joined to play the bass. 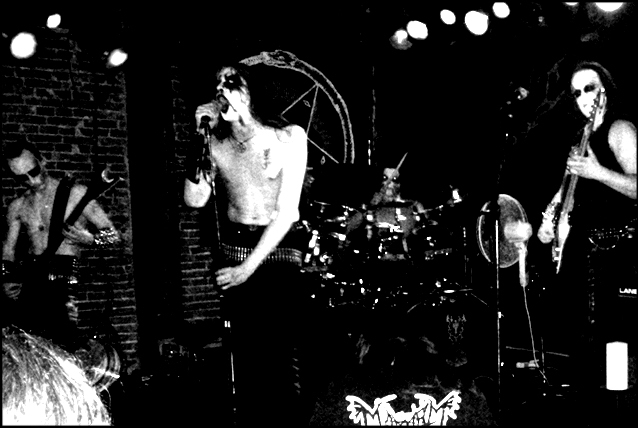 Later in 2003, Hellchrist XUL(Funeral Winds/Domini Inferi) and Balgradon XUL(Funeral Winds/Infinity) joined to play, respectively; guitar and drums, on the third edition of the "Unie vanAtregt" festival in Arnhem, The Netherlands. A recording of this first live performance was released on tape under the name "Live on UVA #3" by "Staalhart productions"(The Netherlands) in co-operation with "Soldiers of Sudarium".Hellchrist XUL and Balgradon XUL decided to maintain fulfilling their tasks in Haatstrijd and a few more live performances were done in The Netherlands and Belgium. Early 2004, Haatstrijd Signed to the Dutch label "Sadolust Records" to release the first recording with the full line up: The "Satansplaag" 7"EP was released in march 2004. Since then, Sadolust Records is Haatstrijd's official label. In September 2005, Haatstrijd decided to part ways with bass player Theriomorph. He was temporarily replaced by Balgradon Xul during the recordings of the debut full-length album entitled "Cacodaemony" wich was released in may 2006 on cd, special edition cd and lp format by Sadolust Records. In may 2006, Haatstrijd found a new bass player in Soturno.